Phishing scam, sites of the month, more! Kiyomoto Ogasawara represents the 32nd generation of his family to offer training in yabusame (archery on horseback). Taking good sports behavior to a new level, two high school basketball players rally fans to support the opposing team. SmartHub is more than just a simple, efficient way to pay your bill electronically each month. In fact, you don't even have to pay your bills through SmartHub to take advantage of account options and settings that can make your life easier. Through SmartHub, you can sign up to get notifications when there is a planned service outage—by email, text or phone recording! SmartHub lets you manage your account in other ways, too—you can update personal info, receive payment confirmation, change privacy settings and more! Of course, especially now with the cost of a first class stamp going up to 55 cents, it always pays to sign up for paperless billing through SmartHub! You can access and pay your bill online, set up recurring payments, and can print your bill for your own records if needed. 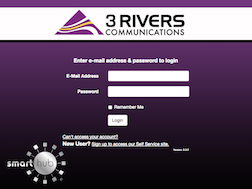 If you haven't already done so, set up your SmartHub account today by visiting 3rivers.net. In this game, you're a chicken in a vehicle. Can you avoid crazy animals and get to the finish line before your fuel runs out? Ready for some foodie fun? Discover new dishes, watch video shows, follow along with instructions, and save your favorites. Forget about expensive puppy training. Get Puppr and take your pup through the easy lessons. Includes a built-in clicker. agoodmovietowatch.com – Perfect for late winter, this site helps you find movies and shows to watch on Netflix and Amazon Prime. Narrow your selections by "top" or "latest," or search according to mood, genre, or staff picks. After you watch the movie, you can comment to help others make good choices. pixlr.com – Need a quick and easy photo editor? Try Pixlr X. Just upload a photo and adjust the user-friendly controls to change your image in any way you want. You can even add text. Then save to your computer to use in a project or share with friends. delish.com – This site shares 53 "old favorite" recipes you can make much faster in your Instant Pot — from entrees such as chicken soup and beef chili to side dishes including risotto and mashed potatoes. When you find ones you love, use the social media links to share with friends. medlineplus.gov – It's still early enough in the year to make good on your New Year's resolutions. If one of them is staying healthy, this site is for you. Explore the extensive Health Topics section to find information about many wellness subjects. Watch video tutorials to learn more about your health conditions. Short Tutorial/FAQ – Do I Need A Smart TV To Use A Streaming Media Player?